You haven’t heard this one before. 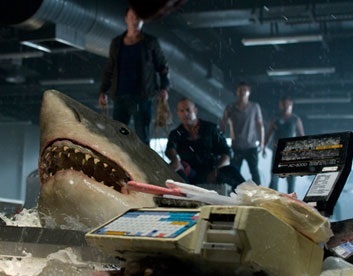 In Bait 3-D, a city is hit by a tsunami and a bunch of people get stuck in a grocery store…with great white sharks! I know. It sounds super stupid. But this is the best shark film I’ve seen in ages. The flood scene rox. There’s major shark action and terror. It’s super suspenseful. Bloody limbs float at the screen in 3-D. Plus the grocery store setup is like an hour and a half of LL Cool J’s kitchen scene from Deep Blue Sea. Actually, most of the group is trapped in the grocery store but a few others are trapped in their cars in the parking garage. And this one couple with their dog gives us all the comic relief. Most importantly, there’s only one stupid caricature of a character in the whole ensemble and there’s no doubt what will become of him. The rest of the cast rules! 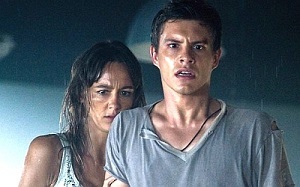 One of our main girls is Sharni Vinson from You’re Next (looking like she was filming both movies simultaneously). Julian McMahon of Charmed and Nip/Tuck is a would-be robber. 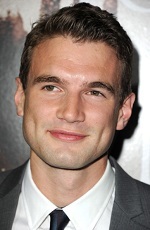 Alex Russell of Chronicle and the Carrie remake (he of the big deep fuckable dimples) is the master of the parking garage. Phoebe Tonkin of The Vampire Diaries and The Originals ain’t afraid of no shark. And there are a shitload of other adorable guys in wet, clinging clothes. On top of all that, there are plenty of cheesy hero moments at the end of the film. 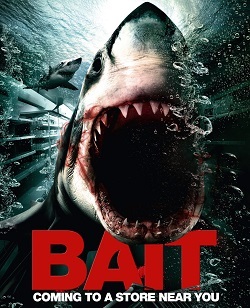 Bait is seriously the first shark movie since Deep Blue Sea that I knew I had to have in my collection the minute I saw it. This entry was posted in Movie Times & Television Schedules - Staying Entertained, The Evil of the Thriller - Everything Horror and tagged Bait, sharks. Bookmark the permalink.